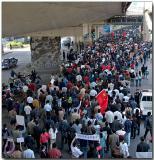 Anti-Japan protests were held across China in April, 2005. The Chinese are protesting against what is claimed to be an attempt to cover up activities during World War II in the history books, Japan's effort to gain a permanent seat on the United Nations Security Council, the true ownership of the Diaoyutai/Senkaku islands, and claims to oil-and-gas rich undersea territory in the East China Sea. This gallery is from the demonstrations in Shanghai over 2 weekends, it is not an endorsement of the activities, it is a photographic representation of the events of the days. These protests started relatively small with a few hundred participants, and grew to several thousand. Thank you for sharing. Excellent work. If I were there, I will be on the street with them. Good coverage of both crowd, and individuals. A polished and accomplished presentation; thanks, congratulations and vote! Good stuff Doug... beats CNN! Thanks for posting.